The T-44-100 is a Rank IV Soviet medium tank with a battle rating of 7.0 (AB/RB/SB). It was introduced in Update 1.57 "Battle March". It is a standard T-44, but with the stronger 100 mm D-10T gun, the same one as on the SU-100 and the T-54 tanks. This is a fast, maneuverable with low profile tank that should be played as brawler, flanker and ambusher. The tank's speed is quite good in Rank IV (compare with previous version T-34-85 and Panther variants) and its gun can compete with 88 mm gun of Tiger II (amount of explosive, shell velocity). This tank isn't suitable for the front-line roles because of the lack of armour and gun depression. Moreover, T-44-100 has a fast reverse speed, making it more of a "shoot-and-scoot" vehicle. The armour isn't very thick, but can bounce some shots. Suspensions wheels and tracks are 20 mm thick. There are tracks giving additional 18 mm of armour on the lower back of the turret. Spaced armour are put on the side that give an additional 6 mm. Ammo racks of the T-44-100. In urban map, go from cover to cover, use binocular to watch for enemy. One shot from the 100 mm cannon wreck the most of the enemy tanks into dust if it penetrates. If you need to move, move fast (reverse a little bit and then run to the next cover), watch for the enemy. Shoot the enemy's side or other vulnerable part, then reverse to cover, repeat. In long-range maps (like Kursk, Mozdok,...). the best way to play is find the cover like a forest or hill to flank enemy's tanks. Remember to watch the sky, some shots from Horten or carpet bombing from Dornier can destroy your tank easily. Tiger II (P) and (H): shoot at turret cheeks (thin part so you should aim carefully), the lower glacis, there is a transmission (Warning: Only shoot this when the Tiger II is facing you directly). If successful in flanking the Tiger II, shoot the part below the turret a little bit. Panther F and Panther II: watch for their maneuver, shoot at turret cheek, hull (directly facing only) and lower glacis (directly facing only). Caernavron: Turret ring and its thin lower glacis (one shot and it will blow up). Hit the side turret as well to knock out the fighting crew. Jagdpanther: Aim at the side of the gun and penetrate through the front glacis. Jagdtiger: Only shoot at lower glacis. Recommend to flank it due to its low speed. Maus: The turret cheek (only below 100m). Recommend to flank the tank and shoot at the lower side with APCR on the side and rear turret. 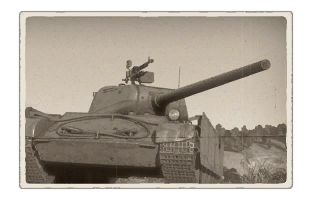 IS-2: Shoot at the flat part of the hull, one shot guarantee. Tortoise: Never shoot the lower glacis, shoot the machine gun position (the upper left side), this can knock out at least 3 crews of it. T95: Commander cupola. Recommend to flank it due to its low speed. The first modifications you should get are “Parts” and “FPE”. The best order for this is: Parts → Horizontal Drive → FPE. After you get those, you can grind what you want. It’s recommended to get the modifications of the Category “Firepower” and “Protection” first. 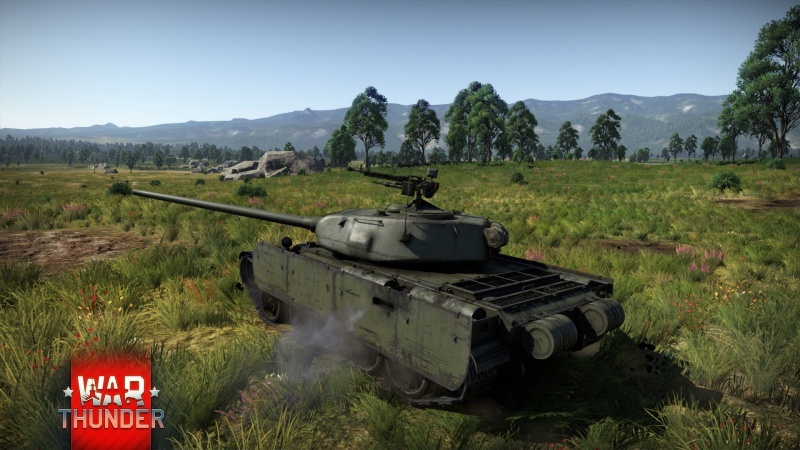 Because its a medium tanks you should also get the modifications “Filters”, “Transmission” and “Engine” as fast as possible, to have a better mobility. Powerful 100 mm D-10T gun with good AP-rounds and a good one-shot-potential. Introduces players to the 100 mm D-10T gun of the T-54 family. 12.7mm DShK machine gun provides effective anti-aircraft defense and saves main gun ammo when facing soft targets like SPAA's. Very maneuverable when fully upgraded, lots of power compared to the T-34-85 and the T-44. Good top speed, acceleration and reverse. Low profile, so you won’t get spotted easily. Good frontal armour. Quite many rounds bounce. Side skirts provide spaced armour. Only -3° of gun depression. 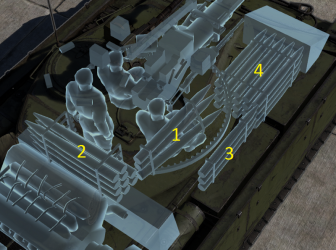 So the T-44-100 favors only flat or hull down/ low lying positions. Quite weak turret armour. The turret cheeks are weak points. 3 of 4 crewman are in the turret, so its easy to one-shot you. Big ammo-rack next to your driver in the front. The T-44 started development in the Autumn of 1943 at the Stalin Ural Tank Factory No. 183, with the objective of creating a tank that is superior to the T-34. The requirement was that it have the same mobility of the T-34, but with more armour on it. In November, chief designer A. A. Morozov presented the T-44's design and model, called Object 136 as a prototype. The first prototype was complete on January the next year and two more in February. The first two prototypes are armed with the 85 mm D-5T gun with the designation T-44-85, while the last had a 122 mm D-25-44T cannon similar to the one on the IS-2 tank (Though differing from one-piece ammunition and better muzzle brake) designated the T-44-122. Overall, the design allowed the T-44 to be much more protective in armour thickness when compared to the T-34 while remaining a lower profile. Trials with the first prototypes began in February 1944. The T-44 with the 122 mm gun was deemed impractical in the trials and was discontinued while the T-44 with the 85 mm gun went on to further development. Improvements and changes went into the design until it was accepted in November 1944, where it was placed into service of the Soviet Red Army. Production started in 1944 at Factory No. 75 and continued building until 1947 with about 1,823 units produced. Despite the T-44's superiority over the T-34 tank, it used the same gun, the 85 mm ZiS-S-53, as its main armament. It was requested that a larger armament be placed onto the T-44 instead for increased firepower. Testing began at October 1944 for this upgrade at the Ural Tank Factory, with the T-44 armed with the 100 mm to be called the T-44B (or the T-44-100). Two prototypes were made for the T-44-100 in February 1945, one with a D-10TK gun and another with the LB-1 gun. 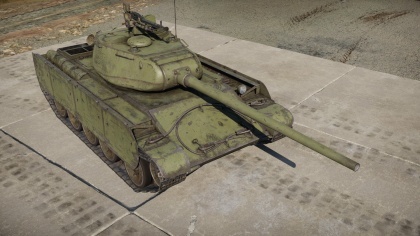 The T-44-100, compared to the original T-44, had its turret ring diameter increased, thicker armour overall, and increased weight. The T-44-100 trials in March and April resulted in positive performance of the T-44-100. The performance the T-44B gave convinced the army that the design had potential and was to not instantly be put into production and instead wait for the entire tank design to be modernized before starting production. Thus, only two working prototypes were made before the entire tank design went into an overhaul. The resulting tank from this development was the T-54 main battle tank. This tank was accepted while all further development on the T-44 stopped. The T-44-100 unveiled to the world. This page was last edited on 13 January 2019, at 17:49.